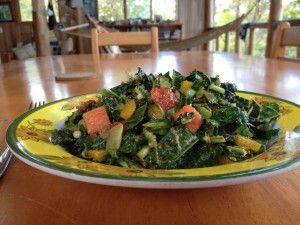 While on a farm in Costa Rica I put this fresh kale salad together. I love to use mandarina aceto, a local citrus fruit here to dress all my salads. One bunch dinosaur kale, about 8 ounces. Pull the kale leaves off the stems and cut into strips. Chop the stems into small pieces. Put them in a large salad bowl. Add the remaining ingredients. Massage the salad with your hands for several minutes to tenderize the kale. Serves 2-4.